SET OF 4x NEW OLD STOCK GENUINE BOSCH GERMANY PETROL / GASOLINE FUEL INJECTORS. 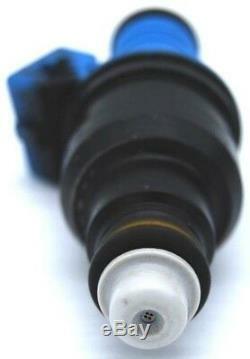 EV1 FITMENT HI FLOW PERFORMANCE FUEL INJECTORS FOR TUNING / UPGRADE APPLICATION. IDEAL FOR N/A / TURBO CHARGED AND SUPERCHARGED L4 ENGINES. PART NUMBER: 0280150985 BOSCH 400 BLUE TOP. INJECTOR BODY: METAL & COMPOSITE PLASTIC WITH FACTORY. FITTED UPPER AND LOWER O-RING SEALS. DESIGN: BOSCH GEN III STYLE EV1. ELECTRICAL CONNECTOR:EV1 2 PIN. LENGTH: 3 inches, 74 mm DIAMTETER: 24 mm O RINGS: Top and bottom, 14 mm RESISTANCE: 14.0 Ohms/HIGH IMPEDANCE. NOZZLE: 4 HOLE DISC TYPE ORIFICE. FILTER DESIGN: BASKET FILTER AT INLET. Part compatibility provided for reference only. QUALITY PRODUCTS AT REASONABLE PRICE. The item "VAUXHALL FORD VW VXR RS VR6 TURBO COSWORTH GTI 400cc FUEL INJECTORS 0280150985" is in sale since Monday, September 3, 2018. This item is in the category "Vehicle Parts & Accessories\Car Parts\Air Intake & Fuel Delivery\Fuel Injectors". The seller is "afuk-parts" and is located in Aberystwyth. This item can be shipped worldwide.